In jazz, sometimes it’s all about the notes you don’t play. In comedy, sometimes it’s all about watching the wheels turn as someone very smart cycles through a million possible next moves and amuses themselves before letting you in. Nowhere is that easier to see than in the carefully crafted comedy of Jo Firestone. Firestone has been a longtime staple of The Tonight Show and was one of the main creative forces in Adult Swim’s Joe Pera Talks With You—a perfect environment for her style of comedy to flourish. She also made a party game called Punderdome with her dad, and it might be on your shelf right now. Yes, that’s this Jo Firestone. 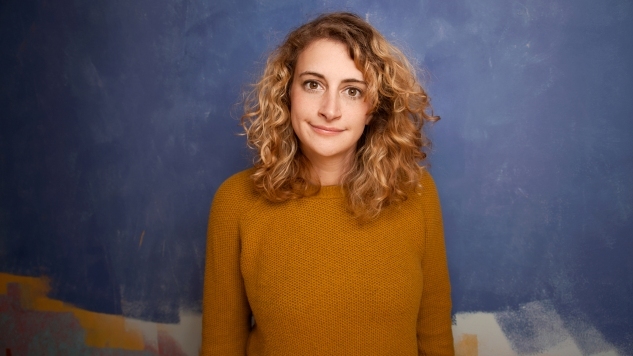 The St. Louis-born comic has been touring the country and pushing a new album that features NPR-style transition music from a member of the Arcade Fire, all while plotting her next big move. We sat down with Firestone just to see how things are going and what we might expect next. Jo Firestone: Have you ever been to Vancouver? Firestone: I always feel bad that people in New York can’t really find their way around. That’s not what happens in Vancouver. They have great donuts that are very hot in Vancouver. Paste: Tell me everything about what you’re doing. What you’re looking forward to, what you’re proud of… you know: summarize your entire life as an answer to one question. I am VERY good at interviews. Firestone: I’m in a denouement. if you will. You’re not supposed to say that, are you? I’m very busy and doing very well and I have so much going on and I can’t keep up. Tell people that. Paste: Oh, you’re serious. You just want me to say that? Firestone: I’ve been doing a few acting gigs but I’m figuring out the next big thing. Write that in bold. Paste: You’re not allowed font control over this interview. If we’re going to talk about acting gigs, tell me about Joe Pera Talks With You. Firestone: He’s a monster. I’m kidding. It’s a dream to get to work with your friends. We all wrote it together and then went up to Wisconsin/Michigan to film it. It was so cold. It was really fun. I’m excited I got to be a part of it. His character in the show is based on information sharing. So it was a lot of figuring out what Joe actually cares about. And Joe really cares about breakfast and knowing a lot about breakfast. And that information transfer leads to the rat musical. That episode was actually supposed to be about hockey but then he came in one morning truly obsessed with the rats in Alberta, Canada. Or, I should say, the lack thereof. And he wouldn’t stop talking about it. So we made the musical about that. It was just about figuring out… what makes a narrative? We came from late night and other places, and this was different. Paste: I have so many friends obsessed with the Alberta rat thing. Firestone: It’s like the plot of that episode where Joe just wants to give more information? That’s just true to form. Paste: You brought up your late night work. You spent a couple of years writing and performing on The Tonight Show with Jimmy Fallon. What was that like? What were your favorite parts? Firestone: There were moments of what you’d expect. You’re running through a hall with script pages and you’re wearing half of a costume and trying to ask a celebrity about a game. It was a good experience. It’s a good group of people there. And it depends on who the people are, whether they’re big or small. I’ve been very lucky to have good experiences with good human beings. Paste: I hope this comes across as a compliment but I can absolutely see Jo Firestone and her hesitation-based comedy starring in a 30 Rock sequel of some sort. Firestone: That building seems to have so many… it’s got a weird gravity to it? If you’re stressed or excited or a breakthrough? Or whatever. 800 people have done the same thing before in the same space. It’s a weird nugget of television history. I came up with this really great sketch but Mike Nichols did that in 1960-whatever too. Paste: The inverse of this is working in a space where people have never done what you’re doing before. Tell me about working on The Special Without Brett Davis. Firestone: That’s more like showing up the night of and there’s a beautiful frantic energy. You get there and people are running around and it’s like “We have a show to do and it has to be an hour long and this is what you’re doing!” It feels like you’re really part of something. And it is so cold in that studio and costumes were brought from miles away but you don’t know what’s going to happen and it’s live television. It’s a good group of people. Paste: Let’s talk about your new album The Hits and how you got one of them dang Arcade Fire boys on it to do transitions. Firestone: Yes, Will Butler. We met once before the recording and ate some snack food and I was like “You get it right?” and he was like “You get it right?” but we’d worked together before and he’s so funny and has natural timing. He said “I know what instrument I’m going to bring!” It’s shaped like a keyboard and has these other instruments programmed into it and… look I know you’re thinking “That’s a keyboard” but it was something else. He’s really fun to work with. Sometimes I get, uh, what’s the word? Tired of my own voice. So it’s nice to have something else in there. By the time you record an album, ideally you can’t stand any of the jokes anymore, so it’s nice to put something in there to shake it up. It’s like how if you’re in a relationship for a long time, sometimes you need to shake it up and go to Disney World or something! Will is my Disney World. Firestone: I was excited to be a part of it. I was truly a featured extra. But I will say I was in the movie and no one can stop me from saying that! But I am a featured extra. I love Mike Birbiglia. I’d never been in a movie before and I might never be in a movie again. So it was nice to be a featured extra in a movie about a thing I know about! Paste: Finally, from a house that loves board games and party games, when do we get more Punderdome? Firestone: What. You need more? You want more Punderdome. Oh. There’s an expansion pack coming. Is that what you’re asking for? Paste: That is literally what I’m asking for. Firestone: There’s an expansion pack coming out. I don’t know when. Paste: What is it like to make a game with your father? Firestone: Whatever you’re thinking: that’s what it is. It’s something physical that came out of a show we did for years, and that he’s still doing. He still comes up to Brooklyn to do the show with millennials and he does his Rodney Dangerfield impression and it’s amazing. Paste: I really want to see that. Jo Firestone’s The Hits is available through Apple Music, Spotify, Amazon, Stitcher and more.